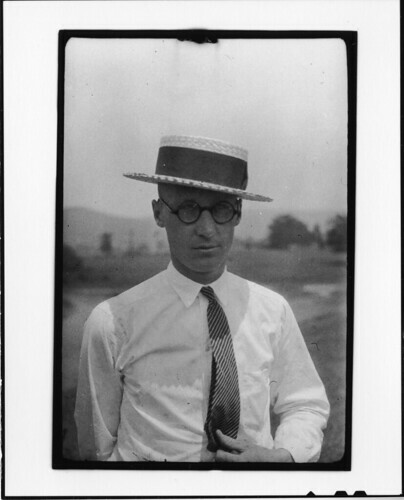 Tennessee v. John T. Scopes Trial: John Thomas Scopes, originally uploaded by Smithsonian Institution. See that guy up there? He's my hero. He taught what he believed to be true, in spite of the social pressures against doing just that. He is John Scopes, the teacher at the center of our country's first (but unfortunately not last) assault on science and evolution. John Scopes, a high school teacher, was charged on May 5, 1925 with teaching evolution from a chapter in a textbook which showed ideas developed from those set out in Charles Darwin's book On the Origin of Species. The trial pitted two of the preeminent legal minds of the time against one another. Three-time presidential candidate, Congressman and former Secretary of State William Jennings Bryan headed up the prosecution, while prominent trial attorney Clarence Darrow spoke for the defense. I'm so glad that the Smithsonian (and their fabulous Library) has made these pictures widely available through Flickr. I'd like to think our country is past this assault on reason, but I'm afraid that's simplistic thinking. Kudos to the Smithsonian for making these historical documents available in an unbiased and documentary fashion through an emerging social network. This is a model that all museums and libraries should follow.